The New York State Athletic Trainers’ Association (NYSATA) is proud to promote efforts that provide public awareness about important sports safety topics, including concussion. 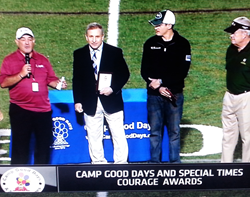 Recently, a NYSATA-endorsed concussion awareness advocate, Ray Ciancaglini of The Second Impact, was featured on a local television special focused on sports concussion – and a few weeks later was honored with the Camp Good Days 2014 Courage Award. Ciancaglini supports NYSATA and ATs, knowing that involving a qualified health care professional, like an AT, can mean the difference in proper management of critical sport-related injuries. As the premier providers of sports healthcare, certified athletic trainers (ATs) are highly qualified and skilled in recognizing, evaluating, and managing athletic-related injuries, including concussions. One unique role of ATs is their focus on injury prevention, which can include musculoskeletal rehabilitation and reconditioning, activity modification, and, oftentimes, providing education and awareness. To help fill this role in New York state for those schools who do not yet have access to a certified athletic trainer - and as a resource for organizations associated with sports or medical professionals that may not be well-versed in the educational background and clinical practice of ATs – the NYS Athletic Trainers’ Association (NYSATA) has been running an outreach initiative across the state. As part of these efforts, NYSATA has had representative ATs present at various conferences in NYS, including the School Board Association (NYSSBA), Academy of Family Physicians (NYSAFP), Society of Orthopeadic Surgeons (NYSSOS), Athletic Administrators Association (NYSAAA), and, most recently, the Brain Injury Association (BIANYS). In addition, NYSATA has endorsed and works closely with The Second Impact and its founder, Ray Ciancaglini, a former boxer turned concussion awareness advocate who suffers from chronic post-concussive brain disease. Since forging a mutual relationship nearly two years ago, Ciancaglini takes any opportunity he has to also help promote NYSATA as a public advocate for sports health and safety and athletic trainers as qualified athletic health care professionals, while telling his personal story to demonstrate the seriousness of sport-related concussions. He does this for the sake of public awareness, knowing that having a qualified health care professional, like an AT, taking care of youth athletes can mean the difference in proper management of critical sport-related injuries. On September 4, 2014, Ciancaglini was featured in a television special on WXXI (Rochester, NY) about sport-related concussions. During the WXXI “Need to Know” program, Ciancaglini shared his personal story of repeated head and brain injuries without appropriate management and how they have affected his life, both in the short- and long-term. He has been battling Parkinson's Syndrome and Dementia Pugilistica, also known as Chronic Traumatic Encephalopathy (CTE), for many years. These conditions are believed to be directly related to multiple concussions sustained during his boxing career that were not properly addressed. In addition to speaking to a sold out crowd of roughly 300 people as the BIANYS conference keynote speaker back in June, Ciancaglini received the 2014 BIANYS Public Policy Award. Ciancaglini was also integral in getting the Concussion Management & Awareness Act for secondary schools passed into law in New York (effective July 1, 2012). This law and corresponding Guidelines, in which NYSATA played a central role, provide an important set of safety standards for concussion management in the high school setting. Most recently, he was honored with the 2014 Courage Award awarded by Camp Good Days and Special Times (Mendon, NY) at their annual Courage Bowl. Nominated by the Athletic Department at the College at Brockport (SUNY), where the 2014 Courage Bowl was held, Ciancaglini was one of two recipients recognized in front of a record crowd of over 9,000 spectators and a regional television audience on September 20, 2014. Continuing on his quest to provide awareness whenever and wherever he can, Ciancaglini subsequently participated as a presenter for a two-day Concussion Symposium at Nazareth College (Rochester, NY) and was the Keynote speaker at the Burke Medical Research and Rehabilitation Center (White Plains, NY) earlier this month. He was also recently offered and accepted the Keynote presentation at the 2015 Washington State Traumatic Brain Injury Conference for survivors, caregivers and professionals on April 28-29, 2015 in Seattle. If your school or organization is interested in hosting a presentation by Ray, please contact him via his non-profit organization, The Second Impact at TheSecondImpact.com. For more information about athletic training, certified athletic trainers (ATs), and NYSATA, please visit our website at GoNYSATA2.org. NYSATA, founded in 1976 and incorporated in 1989, stands to advance, encourage and improve the profession of athletic training (AT) by developing the common interests of its membership for the purpose of enhancing the quality of healthcare for the physically active in NYS. Athletic training is practiced by certified athletic trainers (ATs), who have expertise in the assessment, emergency management, rehabilitation and prevention of acute and chronic sport-related injuries, illnesses and conditions, including concussions. Comprised of over 1,200 certified and practicing athletic trainers, NYSATA is the state-wide affiliate of the regional EATA and District Two of the NATA.